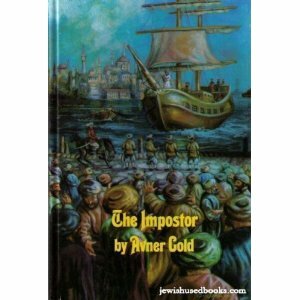 Expert Review of The Imposter by Avner Gold, one of our picks of the top Jewish books for kids! Over the centuries since the destruction of the second Bais Hamikdash, various adventurers and false prophets have laid claim to the royal mantle of Mashiach and promised to bring an end to the long and bitter galus of the Jewish people. These messianic movements have almost invariably brought tragic results, but none more so than the catastrophic messianic campaign of the infamous Shabbesai Tzvi, the central figure of The Imposter, the fifth volume in The Ruach Ami Series. Viewed for the most part through the eyes of the characters of the Pulichever saga, the amazing story of The Imposter unfolds during the middle of the seventeenth century in the heart of the Turkish Empire. Feeding on the profound yearning of the Jewish people for the coming of Mashiach, the mystical cult, formed by the charismatic figure of Shabbesai Tzvi and the burning ambition of his disciples, threatened to engulf the major Jewish communities of the world. "The Imposter" traces the development of this movement from its earliest origins with mysterious midnight meetings on the shores of the Bay of Smyrna to its hair raising climax in the Imperial courts of the Turkish Sultan.